The new facility will allow DAS to continue to grow well into the 21st Century. Dependable Auto Shippers (DAS) and DAS Global Services has moved their New Jersey facility to 1600 Lower Road, Suite 3, Linden, New Jersey, 07036, effective April 24th, 2006. The new facility features 11,000 square feet of office space and a state of the art, 6-acre secured operations facility. The company's headquarters will remain in Texas. The new facility will improve the overall operations in one of the country’s highest population areas. “We are very excited about our new facility. It allows us to centralize our Northeast operation, providing us the capacity to securely hold over 1000 vehicles at any given time as well as house our DAS Global Operations,” said Scott LaForge, DAS’s Executive Vice President. "The new facility will allow DAS to continue to grow well into the 21st Century." DAS is the leader in vehicle relocation services and one of the largest privately held providers of these services in the country. For over fifty years DAS has set industry standards by moving over 100,000 vehicles each year on its fleet of satellite tracked company owned carriers. DAS provides auto transportation services for individuals, corporate relocation professionals and many others. We are capable of moving practically any vehicle to almost anywhere in the world – including motorcycles, boats, RVs and more. 24-hour satellite real-time tracking is available online at http://www.dasautoshippers.com. DAS owns six national facilities and maintains an extensive network of 85+ national terminals and transport affiliates worldwide. DAS is the smart choice for vehicle relocation – cross-country or around the world, DAS gets it there! Dependable Auto Shippers (http://www.dasautoshippers.com) is the United States’ largest privately owned provider of vehicle relocation services. DAS ships approximately 2500 autos daily on its fleet of over 120 auto transport trucks. Founded in 1954, Dependable Auto Shippers operates from its headquarters in Texas, with branch offices in New Jersey, California, and Florida. Using a network of over 85 terminals worldwide, DAS ships cars, trucks, vans, and motorcycles around the world. 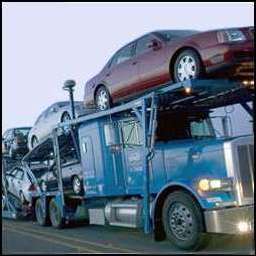 For more information about auto shipping with DAS, visit http://www.dasautoshippers.com.